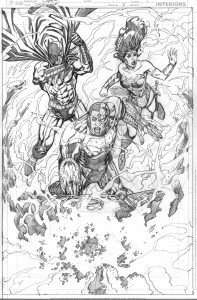 I just finished working on DC’s big event mini-series, Convergence. Like most big cross-over events, there was crisis (no pun intended), confusion, surprises and last minute (no exaggeration) changes. In my case with issue #7, I had two pages that I had to completely re-draw because of script changes. As a result there are two original pages from that issue that will never see print. So I am going to reveal them to you now. 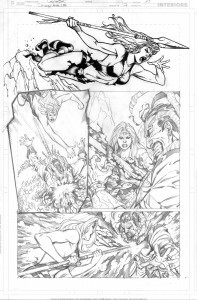 This first page was penciled by me and was actually inked by Mark Morales before the change was made. This is the first page to the comic and it was deemed to similar to the first page of issue #6 so it was dropped. Unfortunate because it is pretty cool. This is a scan of the penciled page. The next page was near the climax of the story. Here we have Warlord’s wife killing our bad guy. Apparently it was thought that the bad guy should have someone more worthy or powerful kill him, so it was changed so that Parallax (Green Lantern) killed him. 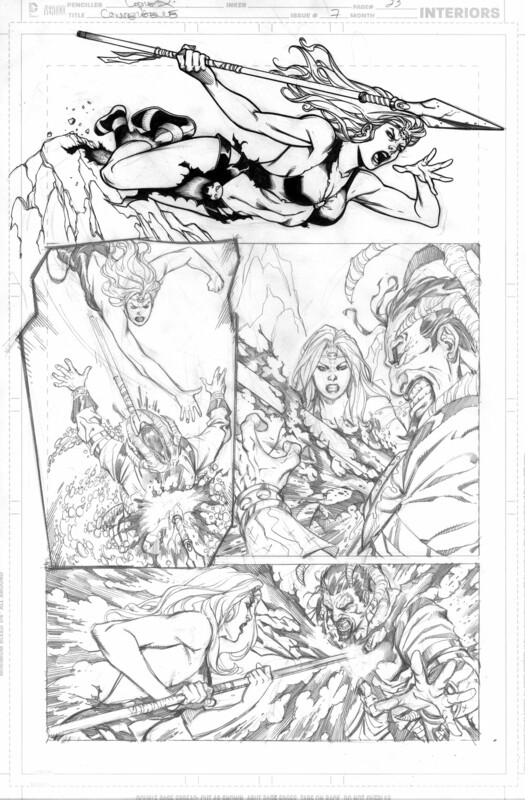 On this page Mark Morales inked the first panel before the change was made. This page is an interesting contrast between the one inked panel and the pencils on the rest of the page. And there you have it. The unpublished pages of Convergence #7! I just returned from Kansas City and the Spectrum Live show. I had a great time meeting some illustrators that I have always admired. It’s a very slow paced and intimate show with a lot of time to hang out and socialize with fans and fellow creators alike. I will definitely be planning a return trip next year. While there, I did do a little business and ended up doing a few commissions. For some reason I only took a picture of one of them. Go figure. Since all of the commissions I did at the show were drawn on Saturday, I only had one to do on Sunday. As a result I spent a lot more time on it and gave the nice lady who bought it more than her money’s worth. 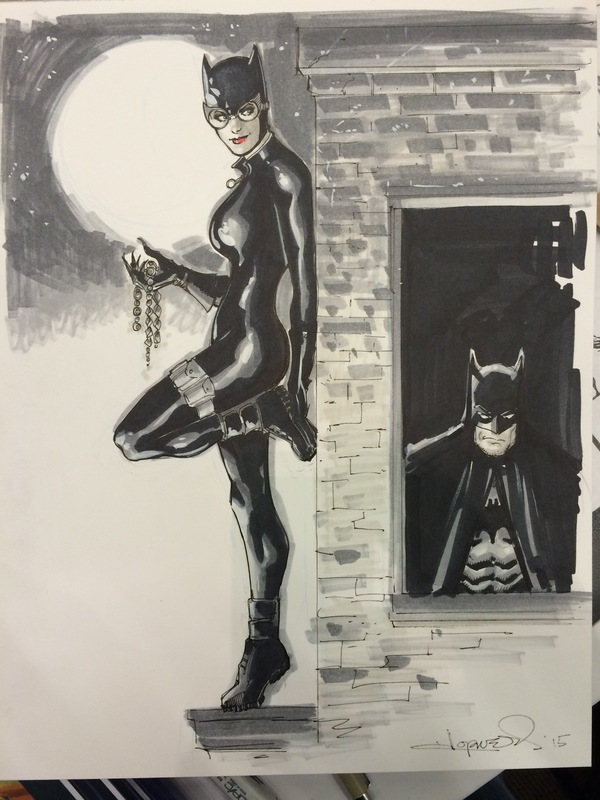 Anyway, here is the Catwoman marker commission from Spectrum. Stay tuned for a Power Cubed update coming soon! 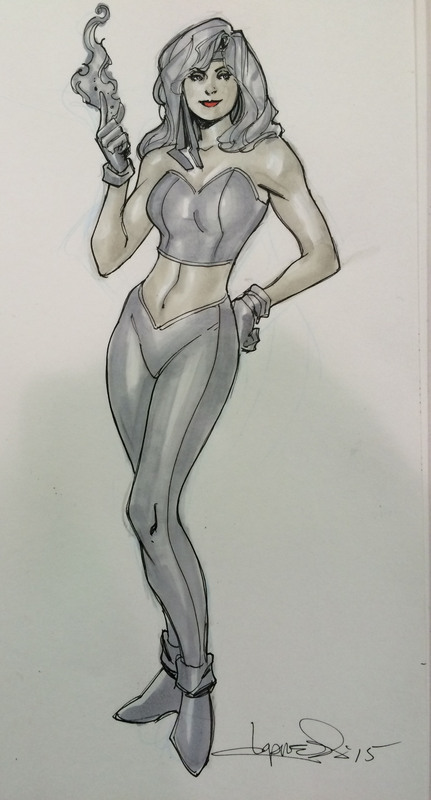 Slowly but surely I am getting better at remembering to take pictures of my convention sketch/commissions. I just got back from a show in St.Paul, MN where I actually took pictures of 3 really good pieces I did. So without further delay, here they are! I did a Tigra that I loved how it turned out. She is in more conservative attire because as many of you know, I have become much more uptight about such things as I have aged. Forgive the shadow creeping into the picture on the bottom right. One of the pitfalls of taking picts at shows. Next we have a classic Enchantress. As you will notice I am starting to use more warm grays for the skin tones. A lot of other people have gone this route and I am finally catching up. The warm grays have a real nice feel to them. Again, forgive the shadow. 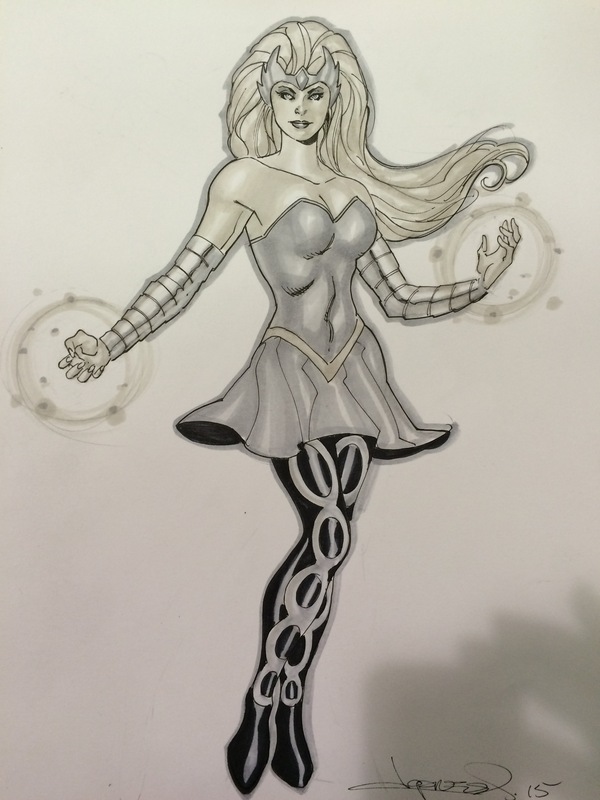 Finally, here is Fire from JLI in her Adam Hughes costume. Ugh, big shadow this time. My web designer and maintenance man, Demian Lee, recently approached me with a kickstarter T-shirt idea. 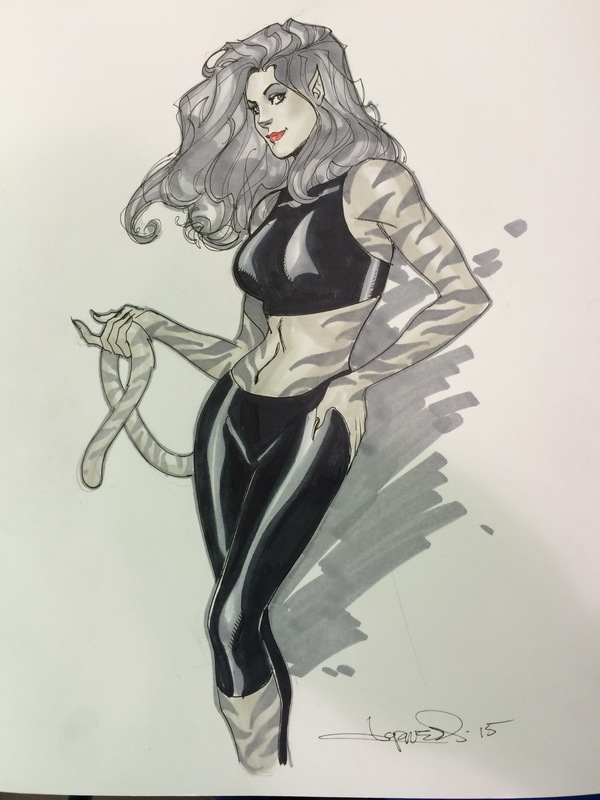 He asked me, Terry Dodson and Joe Vriens to create images for exclusive T-shirts. 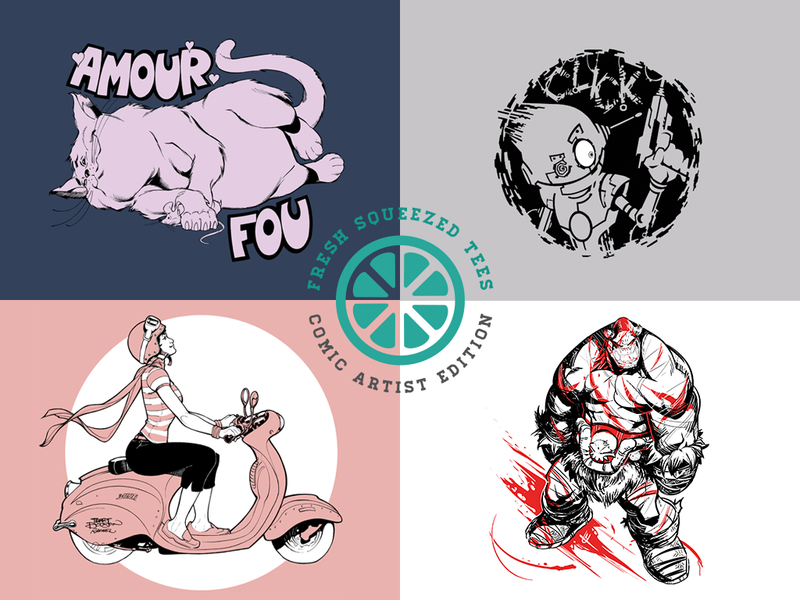 We all obliged and Demian and his crew launched “Fresh Squeezed Tees”. These are exclusive designs and only available through this offer. Until next time, stay clothed!